"Cancer Buddy Support and Caring"
I am going through a difficult time, wish i could chat to someone who understands, has compassion and empathy. I just need a friend to help me through this challenge ! "Cancer" is merciless ! With no respect for fear, pain, anxiety and stress! Always pushing you to your limits ! From the time I was diagnosed with Cancer, right up until today I have relied on my "Cancer Buddy" to help me through those difficult times we all experience on our healing journey's. I believe everyone with Cancer must have a "Cancer Buddy". Someone who fully understands what it is like to have cancer, someone who has experienced excruciating pain in the middle of the night, has had spasms keeping you up all night, cried all night, has been nausea s, depressed and desperate to get support ; having a friend just to share the experience with, someone who wont judge, complain or criticize you. Someone who is compassionate, trustworthy, humble, positive, grateful and has empathy; there to support you unconditionally with love and caring. Having experienced all these horrible situations myself at one time or another over the last year, I fully understand whats required to provide you with support, love and caring. Especially because I have been privileged to have an amazing "Cancer Buddy" to share these terrible experiences with, which was amazing, and very therapeutic. Although my "Cancer Buddy" lives 12,000 kms away on a different continent, and I haven't seen her for years, we communicate by e-mail. This means there is always a delay in getting responses, however what I have experienced is, as soon as I shared my problem on e-Mail, I found immediate closure and could manage the situation a lot better. Obviously if you get a quick response that is a bonus and gives you the strength to see it through. Cancer patients are often very lonely, especially the older people, and often just want to share something that's on their mind. I am scared of injections and often discuss that with my "Cancer Buddy" before going for my blood tests, which has helped me a lot. This is a service I offer anyone who has cancer anywhere in the world. I use e-Mail and I try to respond as soon as possible but sometimes it might be a day or 2 later. This a free, "donations" only service. So only if you are getting some benefit from having me as your "Cancer Buddy" and you are able to make a small donation to help me keep the blog going, then you can consider it, it's totally your decision. I try to respond to every genuine mail I get, but I delete all rude and nasty mail and don't accept any attachments until we have established a trusting relationship. Stay positive, happy, humble, motivated and grateful and you will reap the rewards. 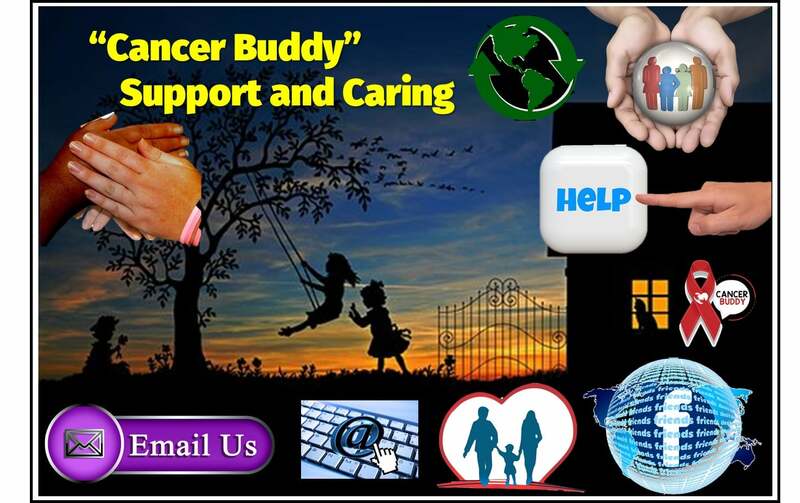 The Cancer Buddy Premium service and support is a membership programme that enables you to connect with me regularly one-on-one through e-Mail or WhatsApp / Viber messaging. This membership enables you to discuss treatment options and my Healing programme with details of my cancer diet and my superfood and supplement programme. The membership is normally $99.00 per month, however i am offering a 50% discount for 3 months - Special price NOW - $49.99. I hope to hear from you if you want a "Cancer Buddy" ?